It’s soup season at Vancouver Farmers Markets and we love to learn and share new recipes from our inventive and talented community! 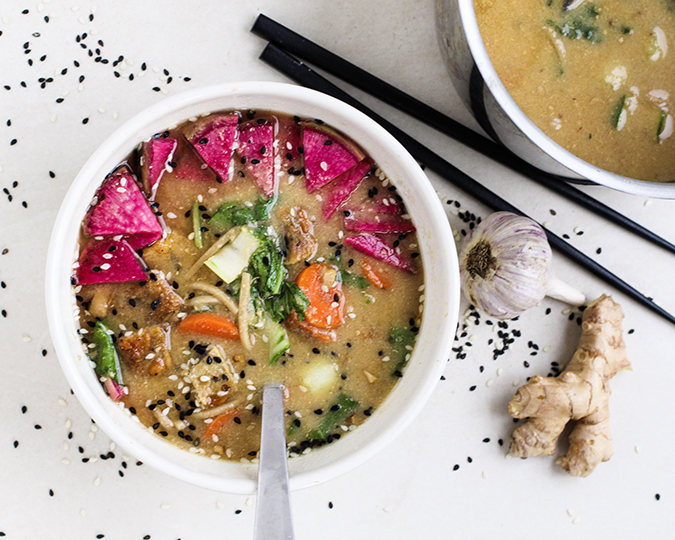 This recipe for Creamy Miso Soup comes from Meghan De Jong, head nutritionist at The Practice Studio and author of the new e-book Eat To Nourish. 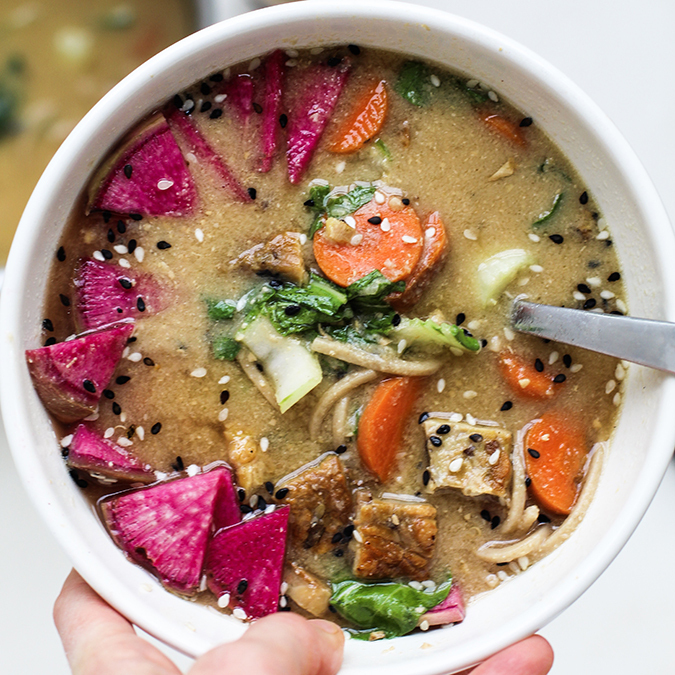 Developed for friends and clients battling colds and flus at this time of year, Meghan’s packed this soup with nourishing veggies and tempeh sourced from the Winter Markets, along with some immune enhancing superfoods. You can find her other whole foods recipes on Instagram @megdejong.nutrition. This miso soup is one of the most healing bowls you can make for the season! It’s loaded with tons of grounding autumn veg, tempeh (fermented tofu), and immune boosters such as; miso, ginger, garlic, and onion. The miso paste, which makes the base of the soup, is full of probiotics to help support gut health and improve digestion. This bowl not only has all you need to stay healthy for the winter, it tastes so creamy and delicious! Heat oil in large pot. Add garlic, ginger, and onion. Sautee for 2 minutes. Add zucchini and sauté until lightly browned. Add water. Let heat for 2 to 3 minutes and then add miso paste. Ensure miso is well incorporated by stirring often. Be sure to not let the water come to a boil (this will kill off the probiotic contents of the miso paste). Once the miso is well incorporated, add the tahini. If using brown rice noodles add to pot. If using soba noodles, cook according to package directions in a separate pot (soba noodles need to be boiled to cook properly) and then add to the soup pot. Add carrots to the soup pot and allow the contents to lightly simmer for 10 to 15 minutes. Heat more cooking oil in a separate pan (cast iron works well). Add chopped “Tempea” tempeh to this pan and cook according to package directions. Once you feel as though the carrots are cooked to your liking, add the chopped Bok choy and tempeh. Serve in bowls. Garnish with chopped watermelon radish and a sprinkle of sesame seeds. Many of the ingredients for this recipe can be found at our weekly Winter Markets at Riley Park and Hastings Park. Use our Vendor & Product Search Tool to find out who has them now!